If you live in the Washington DC area like I do, the words "Peak Bloom" can mean one of two things. For some people, they mean its time to get to the Tidal Basin to see the iconic cherry trees in bloom around the Lincoln Memorial. If you are crowd averse like I am, it means that you should avoid the Tidal Basin at all costs. Fortunately for me, there are lots of other less crowded places to see these beautiful trees in bloom close to my home. 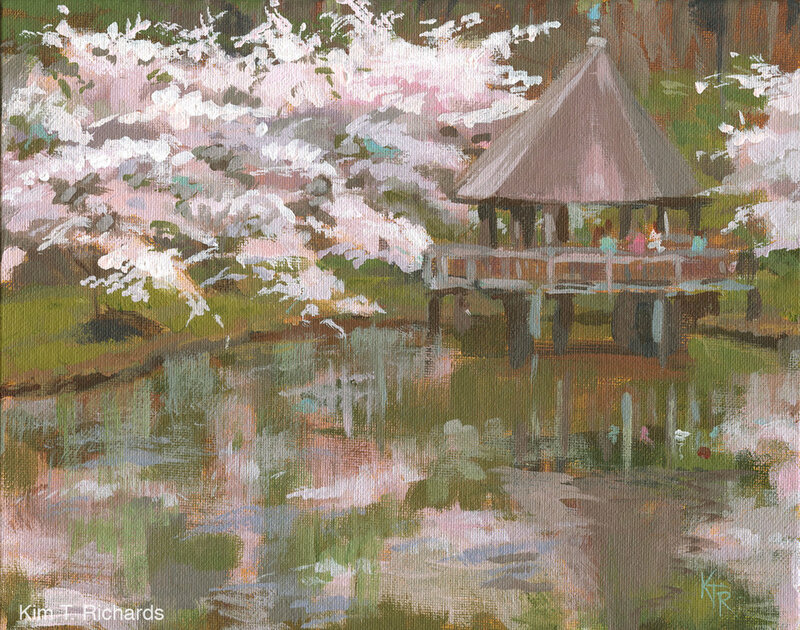 Despite having many paintings in progress last week, the words "Peak Bloom" sent me out with my plein air set up to capture these trees at a man made pond in my neighborhood, and at Meadowlark Botanical Gardens. I’m so glad I did, because a storm came though last night, and blew the flowers off the cherry tress, so all that is left of these blooms are the paintings in my studio.